Orang Melayu kata: indah khabar dari rupa hahaha. The preserved fruits weren't good but the ice cream and pastry was okay. The bridge I climbed back in 2014! Ever since I've heard about the opening of WWoHP at Universal Studio Japan, I've wanted to go because it's Harry Potterrrr! I've been to the one in Universal Studio Orlando and the park was awesome (in fact I heard they're expanding the park now T_T Dammit Universal Studios, why?!). Just be aware that the rides and attractions are all in Japanese, so Harry, Ron & Hermione were speaking Japanese during the Forbidden Journey ride :P As I already went on the ride in Orlando and I could understand some basic Japanese, it was okay for me. It doesn't take away from the experience itself, but it can be a bit frustrating not to know what they're saying as you go through the rides. And with that, we end 7 - Day 10. The next day I would be back to travelling alone and will say farewell to my wheels. It's been a fun 4 days, but I was ready to go to Mt. Koya! wanderlust traveller, malay muslim, engineer, trekkie, food-lover, shoeaholic, bookaholic, feminist. 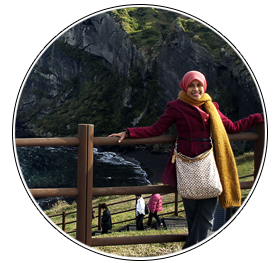 Wanderlust Traveller is a travel diary through the eyes of a hijabi who works a normal 9-to-5 job with a passion for travel. Join me as I go through the thrills and tribulations of travels as a Muslim woman! [KRABI 2015] Carl's Hen's Night! All text and photos are mine, unless otherwise stated/credited. Subscribe now to get notified whenever I update with my latest adventures!